Important policy updates from 17th November, 2017 – 23rd November, 2017. Panel Discussion on Innovative Financing and Market Evolution. Ministry of New and Renewable Energy (MNRE) and Confederation of Indian Industry (CII) organised a panel discussion on ‘Innovative Financing and Market Evolution to achieve 175 GW Renewables by 2022’ at the India Pavilion, CoP (Conference of the Parties) 23, Bonn, Germany. Speaking about the government’s interventions, P C Maithani, Adviser, MNRE said policies are being drafted on a continuous basis to address challenges as the market evolves. Dr. Ajay Mathur, DG, The Energy and Resources Institute (TERI) stressed upon the need to push for higher research in storage technology which could complement the infirm renewable power. There is an imminent need to look at bringing down storage costs. Ministry of Health and Family Welfare, through FSSAI, has notified amendment to Food Safety & Standards (Contaminants, Toxins & Residues) Regulations, 2011. This notification contains maximum permissible limits of various antibiotics in meat and meat products including chicken. Maximum permissible limits of 37 antibiotics and 67 other veterinary drugs are prescribed for chicken. Through this notification, objections and suggestions have been invited from all the stakeholders including general public within 30 days of the notification. CSL’s Rs 970 crore facility to make India self-sufficient in ship repair. The Minister of Shipping, Road Transport & Highways and Water Resources, River Development and Ganga Rejuvenation Shri Nitin Gadkari has laid the foundation stone of a Rs 970-crore International Ship Repair Facility (ISRF) for Cochin Shipyard Limited. The facility is being built at Cochin Port Trust where CSL has leased out a 40-acre plot for the project. He said that Cochin is all set to become a global ship repair hub. The International Ship Repair facility will be a State of the Art facility that can handle a major chunk of small and medium sized vessels plying in India. CSL will set up a ship lift system of size 130 m x 25 m with lifting capacity of 6000 tonnes and 6 work stations. The facility can repair up to 85 vessels, and CSL will thereby be almost doubling the number of ships that can be repaired every year. In a section of the media, it has appeared that there is a possibility that the Central Government may withdraw bank cheque book facility in the near future, with an intent to encourage digital transactions. It is denied that there is any proposal under consideration of the Government to withdraw bank cheque book facility. In this regard, it is emphasized that while the Government is committed to transform India into a less cash economy and promote digital and electronic transactions through multi-pronged initiatives, cheques are an integral part of the payments landscape, and form the backbone of trade and commerce, by being negotiable instruments, which often serve as the security for underlying trade transactions. Logistics Sector granted Infrastructure Status. In a major push to developing an integrated logistics framework in the country including industrial parks, cold chains and warehousing facilities – the government has granted infrastructure status to the logistics sector, enabling the industry to access cheaper finances.To adopt a coherent approach for the development of logistics infrastructure. The former director general of Directorate General of Supplies and Disposals (DGS&D) Binoy Kumar has been appointed as a special secretary in charge of logistics in the commerce and industry ministry earlier this month. Considering a proposal by the commerce ministry, the finance ministry decided to include logistics in the master list of infrastructure sub-sectors. The government has defined “logistics infrastructure” to include a multimodal logistics park comprising an Inland Container Depot (ICD), Cold Chain facility and a warehousing facility with a minimum investment for each category. Development of logistics will give a boost to both domestic and export markets. A Guarantee Agreement for IBRD/CTF loan of USD 98 million and Grant Agreement for USD 2 million for the “Shared Infrastructure for Solar Parks Project” was signed with the World Bank. At that moment Mr. Sameer Kumar Khare, Joint Secretary (MI), Department of Economic Affairs on behalf of Government of India, and Mr Hisham A. Abdo, Acting Country Director, World Bank India, on behalf of the World Bank was present. The objective of the project is to increase solar generation capacity through establishment of large-scale parks in the country. Speakers, Entrepreneurs and Investors Selected for the 2017 Global Entrepreneurship Summit. The 8th edition of the Global Entrepreneurship Summit (GES) is being co-hosted by the United States and India in Hyderabad, November 28-30, 2017, for which 1,500 individuals have been selected to participate. This is the first time the Summit is being held in South Asia. Since 2010, the GES has travelled to Washington D.C., Istanbul, Dubai, Marrakech, Nairobi, Kuala Lumpur, Silicon Valley. The Summit will be inaugurated by Hon’ble Prime Minister, Narendra Modi. Advisor to the President of USA, Ivanka Trump will lead the U.S. contingent to the summit, which will highlight the theme of “Women First, Prosperity for All” and focus on supporting women entrepreneurs and fostering economic growth globally. The Summit will focus on four areas viz. Energy & Infrastructure; Digital Economy & Financial Technology; Health & Life Sciences and Media & Entertainment. Transforming 115 backward districts across the country. In keeping with the Prime Minister Narendra Modi’s vision of a New India by 2022, Government has embarked upon a major policy initiative for the rapid transformation of 115 backward districts across the country. Senior Government officials of the rank of Additional Secretary and Joint Secretary have been designated as Prabhari Officers or the in-charge to coordinate the efforts of the Centre and the states in addressing the specific developmental needs of the districts. Fulfilling the demand of more than three old decades of local public of Kirandul for running of an Express Train in their area, Indian Railways has extended the existing special train between Visakhapatnam-Jagdalpur upto Kirandul (in Dantewada District of Chhattisgarh with effect from 20th November, 2017. This is the first ‘Express’ category train for the people of Kirandul which is a left wing extremist affected area. Under the direction of Shri Piyush Goyal this work was expedited and the promise was fulfilled within a fortnight. This train passes through naxal area like Dantewada with full security. The inauguration for extension of this Train No. 08152 Visakhapatnam – Jagdalpur to Kirandul was done on 20th November, 2017. 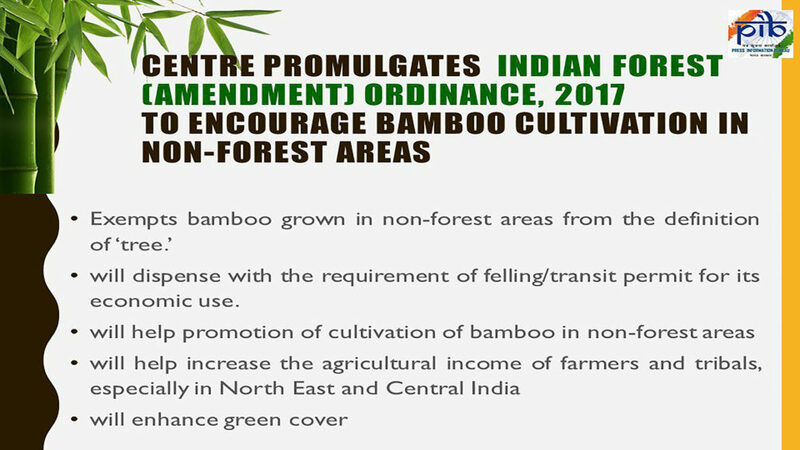 President Ram Nath Kovind promulgated an Ordinance, amending the Indian Forest Act, 1927 which with immediate effect exempts bamboo grown in non-forest areas from the requirement of felling/transit permit. The move will encourage bamboo plantation by farmers and help enhance their income. The Indian Forest (Amendment) Ordinance, 2017 comes a day after the Union cabinet approved the amendment. A bill to replace the Ordinance is most likely to be introduced in the Parliament during its forthcoming winter session next month. The Government of India promulgated the Ordinance to amend the Insolvency and Bankruptcy Code, 2016 (the Code). Earlier the President of India had given his assent to the Ordinance to amend the Code. The Ordinance aims at putting in place safeguards to prevent unscrupulous, undesirable persons from misusing or vitiating the provisions of the Code. The amendments aim to keep-out such persons who have willly defaulted, are associated with non-performing assets, or are habitually non-compliant and, therefore, are likely to be a risk to successful resolution of insolvency of a company. In addition to putting in place restrictions for such persons to participate in the resolution or liquidation process, the Amendment also provides such check by specifying that the Committee of Creditors ensure the viability and feasibility of the resolution plan before approving it.